Jonathan and Patricia Porter have both achieved many things, despite their adveristy rich backgrounds. Through the Wonderful Adversity theme of books and speaking engagements, they work to spread motivation and inspiration to their audience. Patricia was born in poverty in a West African village, where after her father’s death and mother being sent out of the village was able to thrive despite being sent to a Fetish shrine to be sacrificed, beatings, attempted kidnapping and more. She went on to become the first woman in Ghana to achieve the National Pilot’s Licence and the first woman to be recognised as a Rotax iRMT (aircraft engine) technician. She exudes a particular spirit of overcoming the most extreeme challenges which is contagious to say the least. Jonathan’s life has involved many seemingly unsurmountable challenges, from being expelled from school at the age of eight years old through accidents and life-events that have almost crushed his spirit. However, he has learned to use those events as a positive energy towards the promotion of engineering and aviation to others. Jonathan has a natural ability to take complex, often unengaging topics, and bring them to life; and is able to engage large groups, stimulating learning and awareness. 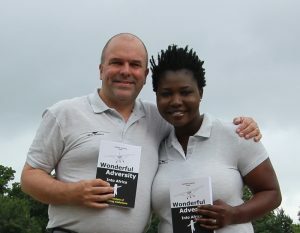 They are both active speakers for events, and enjoy book signing opportunities where appropriate. Copyright © 2019 Promotion of Wonderful Adversity by Metal Seagulls Ltd. All rights reserved.